At 10 servings, this tasty pie is a perfect dessert to feed a crowd. Microwave 16 KRAFT Caramels and 1 Tbsp. water in microwaveable bowl on HIGH 1- 1/2 min. or until caramels are completely melted, stirring every 30 sec. Use instead of the caramel ice cream topping. This is a really good pie, but I think it would have been better if some of the cool whip in the filling was substituted with more pumpkin to give the pie more flavor. 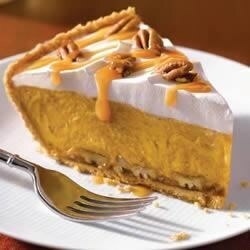 This is the only pumpkin pie I will eat! I took it to my family Thanksgiving last year and everyone else loved it too.